Here is some of the fantastic feedback we've had from our past clients! "I cannot recommend Wessex Midwives enough. It was my first pregnancy and I really wanted to know my midwife and for my midwife to understand my wishes during birth. I dithered about an independent midwife, mainly due to cost, however once I made the decision to go for it I wished I had done it sooner. The relief I felt was incredible and I trusted Caroline from the off. The months flew by and at each appointment Caroline, my husband and I put a birth plan in place. No appointment was rushed and I felt I was listened to every step of the way. I thought my waters may have broken 2 weeks early and Caroline was available by phone immediately. She advised I make my way to hospital for a check up and she met me there. This was a false alarm but a good practice nonetheless. Caroline was amazing the week before birth liaising with the hospital regarding induction/cesarean plans but luckily baby made an appearance before these were needed. My baby was born at home with my husband, Caroline and Erika. It was amazing and could not have gone better. I think this was because I was relaxed in the knowledge that I was in fabulous hands. From speaking to my husband I know he also felt the whole experience was amazing. I think he was sceptical at first but would not hesitate to recommend Caroline. He was given lots of jobs so felt a real part of the birthing day. The after care received is also brilliant and above and beyond anything the NHS can offer. Thank you again for a brilliant experience x" Jenny, 2016. "Thank you so much Erika (supported by Caroline) I fully believe we couldn't have had the natural home birth we had without your support. Throughout my pregnancy, you gave us facts and the confidence to empower us to make our own decisions. Quite simply getting in touch with Wessex Independent Midwifes was singularly the best thing I did: every woman should have an Erika and I wouldn't hesitate to recommend Wessex Independent Midwifes. Thank you again, love all three of us X" Corrie, 2016. "When it comes to planning who is going to be with you to support you when your baby is born, it feels like one of the biggest decisions you might ever make. I feel so incredibly lucky that Rachel was the midwife in the room for me. Rachel has this unique energy that is at once gentle and assured, proactive yet utterly patient and perfectly balanced. It is something that is hard to describe but wonderful to experience. Rachel came for some one to one antenatal visits before the birth which always left me feeling renewed, confident & prepared. She even took extra time to show my older daughter pictures and explain the birth to her in ways she could understand (she is 3 & a half) which I thought was particularly amazing. I was also lucky enough to do pregnancy yoga with Rachel at these visits which I would highly recommend to anyone and everyone. Rachel guides you through a fantastic practice which prepared my body and mind in a way I had overlooked in my first pregnancy. I truly believe this was a large factor in why I had the most incredible home birth experience this time. She is so experienced with home births in particular and she reassured and coached me at just the right moments whilst trusting in nature and me and my baby to let the process unfold without the interventions I had experienced the first time round. 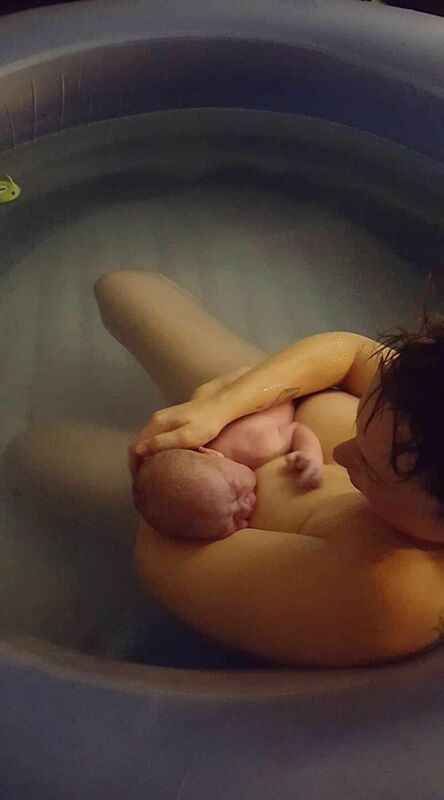 Sky was born after only 3 'pushes' in the pool. As I reached transition (when I began to doubt I could manage it and began to feel a little lost). Rachel told me to look at her and then my partner in the eyes, which sounds simple but was exactly what I needed to refocus and bring me to a place where I knew I could do it! Sky's arrival was truly magical. We were all blown away by it! Rachel's close and continued care after Sky had arrived, both immediately afterwards and for our post natal visit was absolutely second to none. We all looked forward to seeing her and her visits so much. She always made us feel she had all the time in the world for us. For anyone considering an independent midwife, don't hesitate a single moment longer. I would recommend Rachel in a heartbeat. It's a decision you'll be thankful you made forever for you and for your new baby." Rachel, 2017.